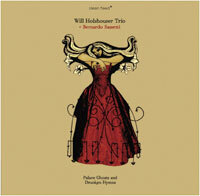 Holshouser’s trio consists of two fine musicians that are unheralded, trumpeter Ron Horton (Andrew Hill and New York’s Jazz Composers Collective) and bassist David Phillips (Freedance). Their previous releases Reed Song (Clean Feed, 2002) and Singing To a Bee (Clean Feed, 2006) display an eclecticism common to modern jazz. With the addition of Sassetti, a pianist comfortable in classical and jazz who also writes film scores, Holshouser’s concept of chamber jazz is realized with true folk sensibilities both inside and out. It may be the Portuguese sailing traditions of gathering influence from distant ports and seeding ideas with commerce that is at the heart of this recording. On “Danca Palaciana,” by Portuguese guitarist Carlos Paredes, the band might begin at Mozart but they end with the dirty rice trumpet of Louis Armstrong at the port of New Orleans. Thus is the mingling of cultures. The romantic folk of the accordion gives way to the classical piano then Ron Horton’s gutbucket snarling trumpet. The quartet has set sail, bringing Europe to the New World. Hello, we’ve found the blues! The disc closes as it opened, at the intersection of classical and folk with “Drunkard’s Hymn,” a church located next door to a tavern. The patrons rush between the two, imbibing the tonic of the preacher and the pitcher. The band plays the proper hymn before Horton’s slurred tones open the bar, and the band gives way to a sort of Americana, a folk music surely with roots in the Old World.